Welcome to the DCM (Doucet's Conveyor Maintenance) website. 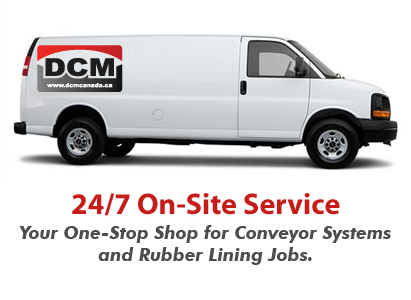 DCM is your one-stop-shop for all of your conveyor system and rubber lining needs. We are a certified Linatex applicator and we are an authorized dealer for many rubber products and adhesives. Experts in the conveyor maintenance and rubber products industry, DCM is always learning and improving upon their business process, offering experienced, certified, field and service technicians. Pulley Lagging - Installed in place on the conveyor system or at our shop. DCM has quickly become a player in the Rubber Lining industry. Their technicians are experienced in working on many sorts of Rubber Lining jobs, be it at your sit or in our facility. We understand the importance of keeping your facility running. When a problem arises in your facility, we are only a phone call away! DCM is also a distributor of all types of different rubber, adhesives and conveyor related products. Our experienced staff will assist you in finding the best product for your applications. Copyright © 2019 Doucet's Conveyor Maintenance Inc. All rights reserved.